Let me tell you something. You need these in your life. I mean, you really need these. After not cooking or doing much after work the past few days, I was finally ready to jump back into my routine a bit. My heart is still heavy with issues of late, but I know I'm doing no one any good, especially my body and bank account, with all this laziness and eating out. I saw this recipe on Jessica's blog, and immediately sent John to the store for the ingredients. Besides John complaining about all the "specialty" ingredients on the list (you'll laugh when you see these so-called exotic ingredients), he was a huge fan of this meal, as was I. I gobbled up two, and was so glad he bought extra salmon for leftovers. These are a breeze to whip up, but so full of tasty flavor. I promise you won't be disappointed. *Heat a saucepan over medium-high heat and add bacon. Cook until crispy and fat is rendered, then remove and let drain on a paper towel. *Preheat the broiler in your oven and place the top oven rack as close as it can go to the broiler. Cut the salmon in to squares pieces that fit the size of your buns, then cover both sides with salt and pepper. Place on a broiler pan (or nonstick baking sheet) and broil for 5 minutes. Gently flip and broil for about 5 minutes more. Note: time may depend on thickness of salmon; mine was 1-inch thick. *In a small bowl, mix mayo with adobo until smooth. 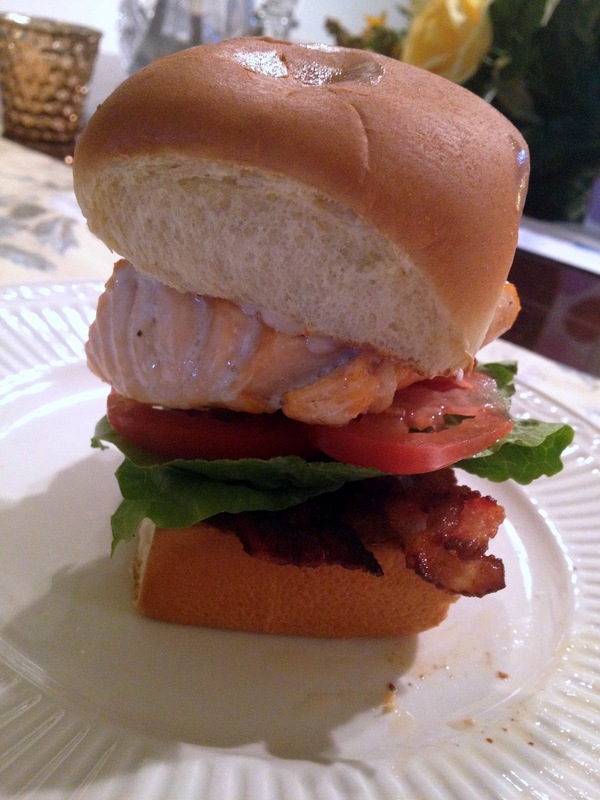 Spread some on each bun, top with a square of salmon, a slice of bacon, a tomato slice and lettuce. Eat!